Council in the Grove Arcade. 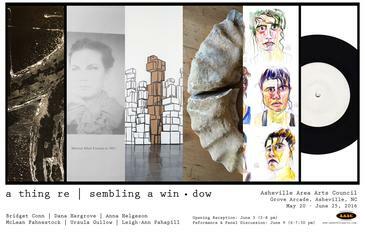 A public reception will be held on Friday, June 3rd from 5 to 8 p.m., with a performance and panel discussion scheduled for Thursday, June 9th from 6 to 7:30 p.m. Part of the Asheville Area Arts Council’s Point of View series, this collective exhibition puts the practice of six local and national artists in conversation through the production of both new and re-imagined works realized in response to the ongoing public art project, Window (re/production | re/presentation). Gilles Deleuze posits in the chapter, “The Image of Thought”, from Difference and Repetition, that the most general principal of representation is the “I think”, and that we truly think only when we have difficulty recognizing. The six artists in this exhibition deeply and inquisitively engage with ideas that inform the instigation and realization of their works, leaving behind interpretive prompts to guide the viewer, yet simultaneously embracing a certain illegibility, disallowing any sort of immediately perceivable meaning to rise forth. As individually or collaboratively authored works, each grouping participates in self-reflexive dialogue around methods and modes of representation and reproduction as integral to their being – through such means as repetitive, durational gestures; material transformation and duplication; archival data assemblage and analysis; or directed investigations of image and identity. Yet, as a collective installation, these works form a distinct entity, with combined components reverberating and colliding against one another, where resemblance presupposes recognition, provoking the “I think” of representation. Works in the exhibition include sculptural fabrications, analog photographic process as material, durational painting reproductions, screen and digital prints, found object studies, archival audio works, and performance. Included in the exhibition are Bridget Conn (Asheville, NC), McLean Fahnestock (Nashville, TN), Dana Hargrove (Maitland, FL), Anna Helgeson (Asheville, NC), Ursula Gullow (Asheville, NC), and Leigh-Ann Pahapill (Toledo, OH and Toronto, ON, Canada). Dawn Roe (Asheville, NC and Winter Park, FL) founded Window (re/production | re/presentation) in the spring of 2013, and serves as curator for this off-site exhibition. A print-on-demand booklet including a curator’s essay, artist statements and installation images will be produced in advance of the public opening.